On 23 July 1916 the 1st Australian Division launched an operation that began Australia’s contribution to the great British offensive of that year, the Battle of the Somme. On that day, some three weeks after the Somme offensive began, the 1st Australian Division attacked the French village of Pozières. Two days later the entire village was in their hands. Over the next six weeks, the three divisions of 1st Anzac Corps, the 1st, 2nd and 4th Australian Divisions battled their way along the high ground, securing the menacing OG Lines to the north-east of the village, and inching towards the fortified German strongpoint at Mouquet Farm. In the process, the Australians suffered some 23,000 casualties. The most successful phase of the Battle of Pozières Ridge was its first. On 23 July 1916, the 1st Division of 1st Anzac Corps advanced under the cover of a lifting artillery barrage from a trench some 1500 yards to the south east of Pozières, to the south side of the Albert-Bapaume Road. Vicious hand-to-hand fighting ensured the capture of German strong posts in the houses, cellars and yards along the south-east edge of the village and Gibraltar, a significant strong point at the south-western edge of the village itself. Over the next two days, the Division was able to push through the main part of the village, which lay to the north-east of the road, and extensive fortifications to take possession of the entire village. 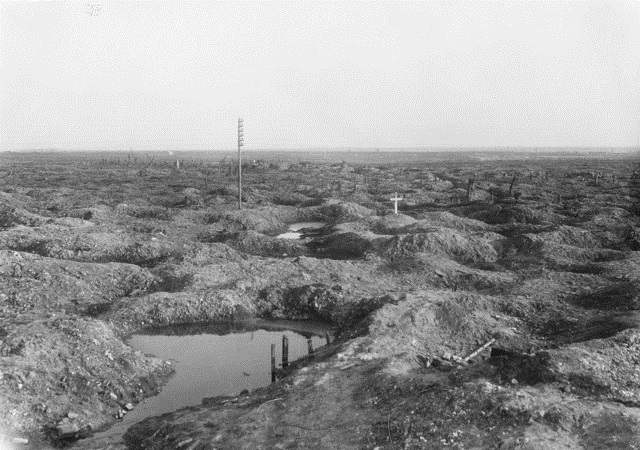 This first attack, while successful, failed to deal with the major German defences in the Pozières sector—the OG Lines. These heavily-defended trench lines were part of the German second line of defence on the Somme, and ran more or less parallel to the direction of the operation, that is, from the south-east to the north-west. When the 1st Division was relieved by the 2nd on 27 July 1916, the capture of the OG Lines became the highest priority. The 2nd Division took two attempts to capture these lines, struggling to make headway against uncut barbed-wire defences and German defenders who were well aware of the coming attack and well-armed with machine guns. It wasn’t until the second attack on 4 August that the division successfully captured the lines and secured the right flank of the Australian operations. From this point on, the OG Lines were held more or less in a defensive capacity only, and the main focus of operations shifted to the north-west. The overall plan in the sector was to capture the ridge which swept away towards the village of Thiepval. The 4th Division, on its arrival to the line on 7 August 1916, began a complicated series of operations that inched the line towards Mouquet Farm, the major German defensive work between Pozières and Thiepval. Each of these operations was conducted on a small front with smaller objectives and achieved a slight modicum of success in advancing the line, but at a high cost in men and materiel. On its relief some nine days later, the 4th Division had advanced the line to within 600 yards of Mouquet Farm. Each of the three Australian divisions returned to the front line once more before the 1st Anzac Corps was replaced in the line by the Canadian Corps. Even Charles Bean, with his determination to put as much detail into his Official History as possible, had to preface his chapters on what happened next with the statement ‘the series of battles which ensued, repeating as they did within a narrower area [than] most of the horrors of the Pozières fighting, cannot be described with the minuteness hitherto employed’. The Australians never managed to capture Mouquet Farm, and in fact only directly assaulted the position twice. Their attacks slowly petered out before all three divisions were sent to Belgium to recover. Although the Battle of the Somme is largely remembered for its major operations—1 July, 14 July, 15 September—the other 138 days comprised of small-scale, disjointed attacks just like those conducted by 1st Anzac Corps along Pozières Ridge. These operations were too often so rushed, disjointed and badly integrated with firepower that on most occasions they didn’t stand a decent chance of success. In too many cases the objective didn’t matter to the success of the overall campaign, instead attacks were launched on little more than the next trench, the next strongpoint, the next machine gun. Men struggled towards ill-defined objectives on a moonscape battlefield under an interminable hail of artillery shells and machine gun fire. In 1916, this was the war the infantry knew. Mouquet Farm was not captured until 26 September 1916, long after it had been outflanked. On that day the 6th East Yorkshire Pioneer Battalion was working in the vicinity of the farm digging communication trenches. After a bomb fight lasting four hours, the small garrison of around 35 Germans gave themselves up. If Pozières Ridge was part of the battle that had to happen on the way to success, it was a costly path indeed. Meleah Hampton is a military historian at the Australian War Memorial and author of the recently published Attack on the Somme: 1st Anzac Corps and the Battle of Pozières Ridge 1916.